The New Atheists have been getting a lot of attention lately; first from the general public because of their writings, and then from the Christian community because of the general public's interest. And just as the ideas of the Dawkins, Harris, Hitchens and Dennett have spawned several books, so the rebuttals of Christian academia have also been the fodder for many publications in the last year or so. 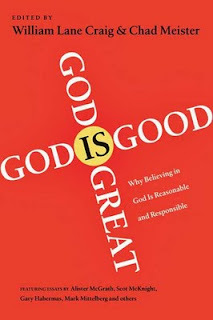 God Is Great, God Is Good is one of the finest examples of this mini-genre and it brings together some of the sharpest minds in Christian apologetics. Names like Michael Behe, Gary Habermas, and William Lane Craig offer their best defense for Christianity against the charges of the New Atheists. The diversity of authors in this book is perhaps both its greatest strength and its greatest weakness: strength because each author can focus on their respective field, and weakness because there is a noticeable absence of a clear train of thought from one chapter to the next. These authors certainly are nicer (and at times more academic) than the New Atheists have a reputation of being. Love them or hate them, however, the New Atheists seem to connect with something in their audience when they are at their most acerbic, sarcastic, and down-right nasty. There is a side of me that wishes that someone would sink to their level and deal with their charges in like form, but it is certainly to Christianity's credit that no one yet has done so. All in all, God Is Great, God Is Good is a great book from many great writers addressing the challenges levelled by the New Atheists. While a few of these ideas and arguments may be over the heads of some, this book is a perfect introduction for someone who is ready to tackle the hot topics of the debate but is unfamiliar with the major players or where to get started. I appreciate the tip to this book, but I have to say it's ultimately a losing battle. The New Athiests are right, of course, unless they are wrong, and that's really the only argument one can make--sink to their level or not. Their argument is that 1) a large number of beliefs held by an equally large number of religious believers (not just Christian, of course) are demonstrably false (if one trusts the bugaboos of "science" and "history") and 2) those beliefs that aren't demonstrably false clearly require a confidence in otherwordly beings/events/etc which are completely devoid of supporting evidence. The religious response is 1a) my faith trumps your science and history or 1b) I can fold your science and history into my religion (that is, the New Atheists have a harder time with "liberal" or "modern" or what-have-you religions than they do with those of a fundamentalist bent) and 2) yeah, so what? You do seem to summarize two of the New Atheists' most common arguments. There are problems with each, however. 1) A large number of beliefs held by religious believers are demonstrably false if you approach the entire project with a naturalistic worldview that presumes the non-existence of the supernatural and anything that can't be examined by the scientific process. 2) The avocates of Intelligent Design would flip to hear you suggest that their beliefs are "completely devoid of supporting evidence". Their argument is that, precicely because of the evidence provided by scientific investigation, their beliefs are not only justified, but perferred over the neo-darwinian synthesis. I agree with Johnnie about the losing battle. Who can prove anything? God revealing himself to people is sacred, and it seems pretty random.